From the author of Enlightenment Now, a short and entertaining book on the modern art of writing well by New York Times bestselling author Steven Pinker. Why is so much writing so bad, and how can we make it better? Is the English language being corrupted by texting and social media? Do the kids today even care about good writing? Why should any of us care? 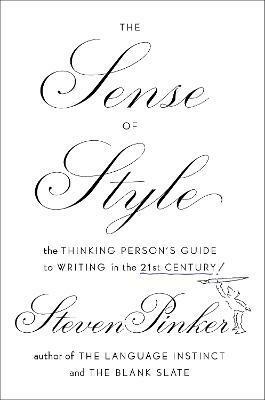 In The Sense of Style, the bestselling linguist and cognitive scientist Steven Pinker answers these questions and more. Rethinking the usage guide for the twenty-first century, Pinker doesn't carp about the decline of language or recycle pet peeves from the rulebooks of a century ago. Instead, he applies insights from the sciences of language and mind to the challenge of crafting clear, coherent, and stylish prose. In this short, cheerful, and eminently practical book, Pinker shows how writing depends on imagination, empathy, coherence, grammatical knowhow, and an ability to savor and reverse engineer the good prose of others. He replaces dogma about usage with reason and evidence, allowing writers and editors to apply the guidelines judiciously, rather than robotically, being mindful of what they are designed to accomplish. Filled with examples of great and gruesome prose, Pinker shows us how the art of writing can be a form of pleasurable mastery and a fascinating intellectual topic in its own right. "A supremely important book...a masterly achievement." "One of the most important books I've read--not just this year, but ever." "Packed with information...Clear, witty, attractively written." "A display of fiercely intricate intelligence." --The New York Times Book Review "Masterly." --The Wall Street Journal "One of the most important books I've read--not just this year, but ever." --The New York Review of Books "A display of fiercely intricate intelligence." --The Times (London) "Engaging and provocative . . . It's good to have a mind as lively and limpid as his bringing the ideas of cognitive science to the public." --Douglas Hofstadter, Los Angeles Times "Curious, inventive, fearless, naughty." "Sweeping, erudite, sharply argued, and fun to read . . . also highly persuasive." --Time "Ought to be read by anybody who . . . thinks they already know where they stand on the science wars. . . . It could change their minds."